I alway s feel in a state of limbo when I come back from a long-haul flight. There is that lull between landing and pushing open the front door which can seem a bit surreal; and then life returns to how it was before, albeit with the addition of some wonderful memories and experiences. 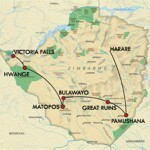 Tourism in Zimbabwe has been in a state of limbo for over ten years. Politically and economically the country has been a disaster, and so the British (in particular) have been reluctant to go there. But the infrastructure is still there, and I have just motored over 1,500 miles in a Toyota Familia on roads that are smooth and carry little traffic. When I wanted to check the directions (sure, some of the sign posts have been removed or purloined), I was greeted by warm, friendly and extremely helpful people. Even the police were most courteous as they extracted some $20 from us for speeding on a long and tempting empty road…but that may have been because one of my travelling companions gave them our delicious homemade choccie biscuits! M y journey started at the vibrantly decorated and beautifully managed Pamushana Lodge operated by the Singita collection. It is located in the far south of the country on a 160,000 acre concession owned by the Malilangwe Trust. This is a conservation story in itself: the trust is funded by a very rich man indeed with a serious preservation mission which means no expense is spared in giving guests a fantastic time. More to the point, you can fly into a tiny international airport called Buffalo Range direct from Johannesburg and be at the lodge 45 minutes later which makes it a brilliant place to go as a stand-alone destination linked to something else in South Africa. Even more to the point, I saw the Big Five in one day here; tracking a young leopard as it stalked a number of impala (unsuccessfully in the end) was quickly followed by watching a pride of lion on a kill, with hyena circling, awaiting their turn and at times being chased off. Moving west I visited the great ruins which are Zimbabwe’s equivalent of the pyramids and the largest ancient stone structures south of Egypt. The country is now named after them. Once home to a thriving trading empire it was at its zenith when the Black Death was ravaging England. Artefacts from China have been found on the site. No one can fail to be impressed by the stone walls, some of which are eleven metres high and five metres thick. 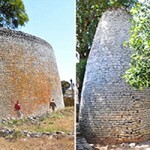 Archaeologists still puzzle over a ten metre high conical tower. Is it a grain bin or a phallic symbol? 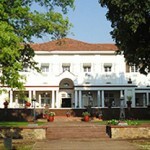 In Bulawayo, the country’s second city, I wandered about the centre and felt completely safe. Ladies were sassily sporting the latest brightly coloured fashions, and guys looked buff. It felt distinctly upbeat. 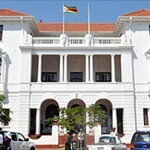 The Bulawayo Club was on its knees until last year when a local family took a management contract from the members and revived its spirit and the standard of comfort it provides. It offers a fascinating time-warp with its antique furniture, memorabilia and photographs from the old colonial world. Our guide Paul, who seemed to have a fistful of degrees in archaeology and is able effortlessly to communicate his enthusiasm for the history of his country, is potentially the new David Rattray of Zimbabwe. Incidentally, the National Railway Museum here has one of the best railway engine collections in the world. 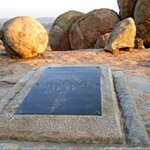 Later, Paul took us to the Matopos Hills where we stood by Cecil John Rhodes’ grave and were told about the elaborate plans he made for his interment. It took some ten days to transport his body from Cape Town where he died in March1902 to the site. Eventually three coffins, one inside another, were needed (reassuring if you think about the heat at that time of year in Africa). Rhodes, a hugely rich entrepreneur at a young age, was of course a conspicuous force in the expansion of British territories in Southern Africa. He probably was responsible for ensuring Bechuanaland (now Botswana) remained a British possession instead of falling to the Boers. It is quite extraordinary that only a hundred years ago a rich mining magnate was able to insist that a country was named after him. We also heard tales of the last stand of the Shangani patrol (1893) – a heroic event that gave Rhodesia its first white martyrs. These historical tales have a particular poignancy when you are standing on the very spot where they occurred listening to a guide who is passionate about his subject. Moving north, I visited Hwange National Park, surely one of the best places to see concentrations of elephants in the dry season. 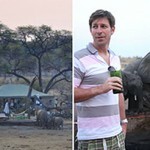 At one authentic bush camp I visited, the swimming pool had become the elephant pool, and the guests sipped their G and Ts and nibbled bitings less than ten feet from a thirsty bunch of even larger mammals. Two years ago when I last visited Victoria Falls it was a ghost town; now, with the Zimbabwean dollar consigned to the rubbish dump and hard currency in play, the shops are full, the streets are bustling and the terrace of the Victoria Falls Hotel (the grand old lady of the Falls hotel industry) is alive with the sound of clinking cups and saucers and the gentle munching of cucumber sandwiches. I really did find it a thrill to see Zimbabwe’s tourist industry working again. 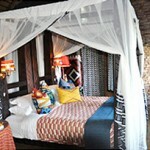 The game is still there, the guides are some of the best in Africa, and the historical dimension is a major attraction. Fortunately, I only managed to travel to the south and west of the country which means I have to go back and check out the north and east.